The EOS 5D Mark III is now on their website as well as the Speedlite 600EX-RT, Speedlite Transmitter ST-E3-RT, Wireless File Transmitter WFT-E7A and GPS Receiver GP-E2. Pre-order information coming soon (cameras will be shipping in 2 weeks, so no long wait this time). ISO range 100-25600, expandable to 104,200. Another big announcement is the arrival of a new flash, this time with more power and radio-control support (i.e., no more Pocket Wizards / Radio Poppers required). This is about 5 years overdue, so it's a welcome addition. Of course this is just more money to blow this year, but hey that's the price of progress! While my wallet can’t handle all of these cool product announcements, Bill Me Later will be glad to see me coming! For sophisticated wireless flash setups, there's nothing like the new Speedlite Transmitter ST-E3-RT*. Facilitating radio controlled, two-way wireless transmission up to 98.4 feet, among up to five groups or fifteen individual Speedlites, the ST-E3-RT represents the next generation in wireless flash systems. With operational controls similar to the new Speedlite 600EX-RT, including diverse flash metering options, and a number of flash modes, the Speedlite Transmitter ST-E3-RT makes complex lighting setups simple. 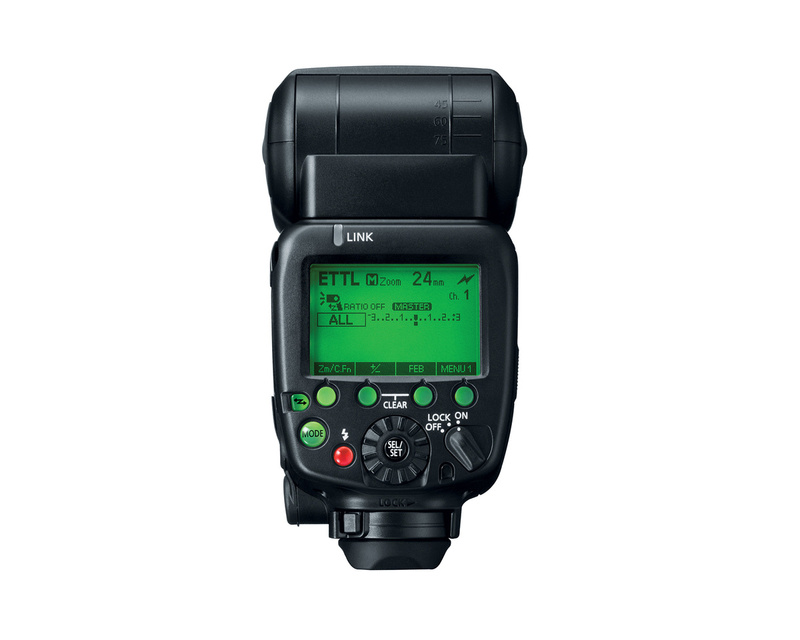 With a compact design and highly reliable construction, combined with a clearly laid-out information panel and buttons with back lighting and more, the Speedlite Transmitter ST-E3-RT is an indispensible tool for advanced, professional flash photography. *Because it does not have an optical transmission function, the Speedlite Transmitter ST-E3-RT is not compatible with earlier Speedlite models such as 580EX II. 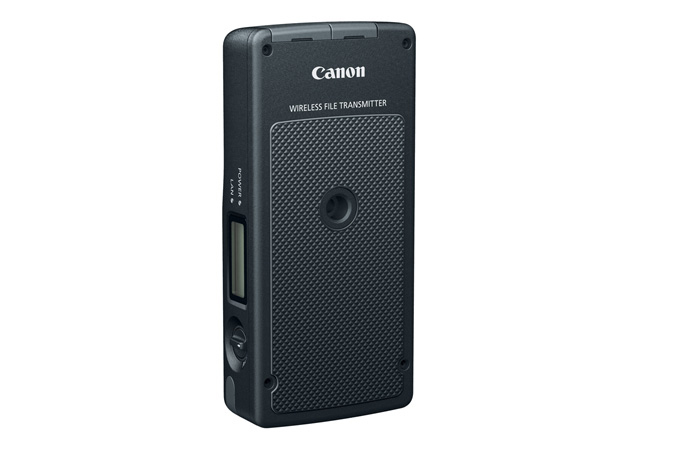 Canon's new WFT-E7A makes wired and wireless data transfer setups simple and easy. Compatible with the EOS 5D Mark III DSLR camera, it supports IEEE 802.11 a/b/g/n for fast and secure connections over a LAN connection and supports Gigabit Ethernet for wired connections, too. For even more versatile connectivity, the transmitter has a built-in Bluetooth function that allows it to handle high-volume data wireless transfers. Its lightweight design makes the WFT-E7A a great addition to the professional photographers wireless workflow. 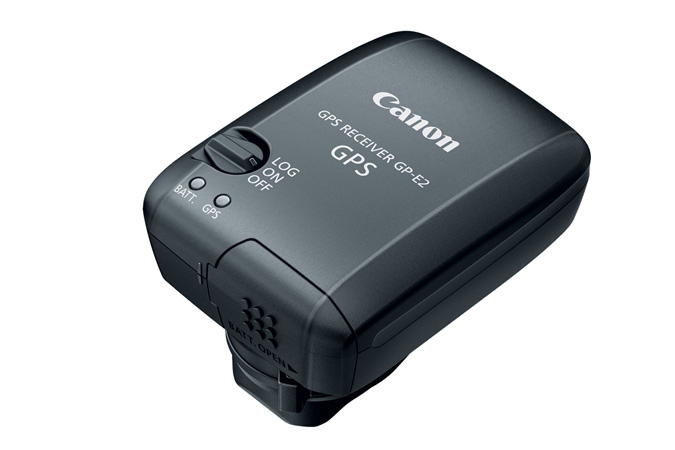 For simple and accurate recording of time and location information, Canon's compact GPS Receiver GP-E2 is the perfect complement to the EOS System. The GP-E2 records location information such as longitude, latitude, elevation, direction and Universal Coordinated Time (UTC) as EXIF data, while also serving as an electronic compass on camera or off. 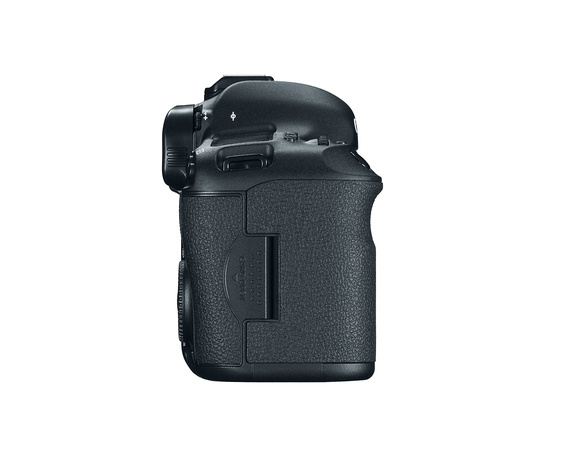 Versatile connectivity options include USB and hot shoe connections with the EOS 5D Mark III and the EOS-1D X (USB connection only with the EOS 7D); smart design and rugged construction ensures reliability plus the ability to be used as a standalone GPS recorder. The newest GPS system designed specifically for the EOS system, the GP-E2 is an ideal tool for photographers on the move. LAKE SUCCESS, N.Y., March 2, 2012 – On the 25th anniversary of its world-renowned EOS System, Canon U.S.A., Inc., a leader in digital imaging solutions, is proud to announce its latest model, the new EOS 5D Mark III Digital SLR Camera. Positioned between the extremely popular EOS 5D Mark II and Canon's top-of-the-line professional EOS-1D X model, the EOS 5D Mark III delivers superb image quality, thanks to a new 22.3-megapixel full-frame Canon CMOS sensor, a high-performance DIGIC 5+ Imaging Processor, a 61-point High Density Reticular Autofocus (AF) System and six frames-per-second (fps) continuous shooting speed. Building upon the trailblazing success of the EOS 5D Mark II, the EOS 5D Mark III also incorporates enhanced video features for professionals in the fields of cinematography, television production and documentary filmmaking, including better noise reduction, longer recording times and a built-in headphone jack for audio monitoring. The EOS 5D Mark III is Canon's answer to hundreds of thousands of advanced amateurs and emerging professionals looking for a compact, high-quality camera system to help them achieve their artistic vision, whether it be through still or video imagery. 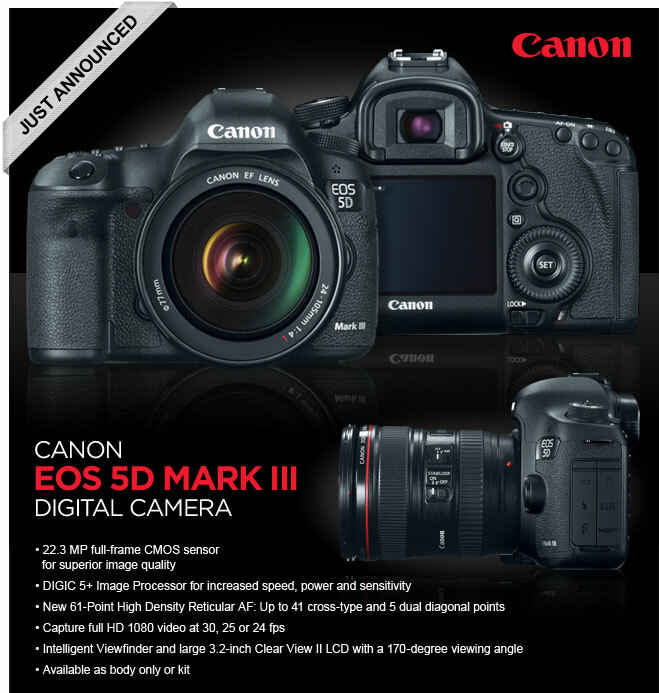 The EOS 5D Mark III introduction coincides with Canon's 25th anniversary celebration of the EOS camera system. Canon's award-winning EOS system first debuted in March of 1987 with the introduction of the EOS 650 SLR camera and three EF lenses. "We are extremely excited to announce the highly anticipated follow-up to our EOS 5D Mark II, a camera which has been called a 'game-changer' in most professional photography and videography circles. The EOS 5D Mark III will carry on that tradition, delivering better and more advanced features, helping our customers achieve excellent image quality for stills and video," stated Yuichi Ishizuka, executive vice president and general manager, Imaging Technologies and Communications Group, Canon U.S.A. The EOS 5D Mark III inherits many features from Canon's recently announced flagship DSLR, the EOS-1D X, including a DIGIC 5+ Imaging Processor and a high-performance 61-point High Density Reticular AF array with up to 41 cross-type points and five dual cross-type points available, depending on the lens in use. The enhanced processing power enables fast continuous shooting of up to six fps, exceeding the speed of the EOS 5D Mark II model by more than 50 percent, and with improved weather resistance the EOS 5D Mark III is a serious option for sports and wildlife photographers. The EOS 5D Mark II blazed the trail for EOS cameras and Canon to enter the professional video and cinema markets, paving the way for Canon's recent introduction of the Cinema EOS system of cameras and lenses. Now, the EOS 5D Mark III continues Canon's commitment to these new markets with new and requested features from cinematographers, television production professionals and independent filmmakers. This new model captures 1080p Full HD video at 24p (23.976), 25p, and 30p (29.97) fps; 720p HD recording at 60 (59.94) and 50 fps; and SD recording at 30 (29.97) and 25 fps, giving cinematographers and videographers more flexibility and options for video capture. The new full-frame CMOS sensor and DIGIC 5+ processor have enhanced the camera's image processing performance over the 5D Mark II, significantly reducing moir‚ and color artifacts in scenes with horizontal lines. The video footage produced will exhibit less moir‚ than seen in previous DSLR models, resulting in a significant improvement in HD video quality. 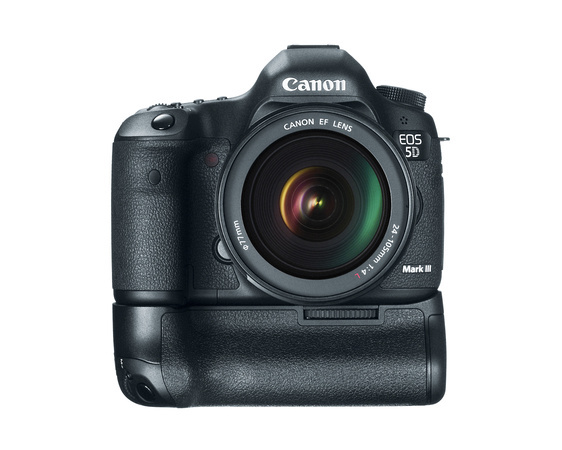 Accommodating documentary filmmakers, and event videographers using EOS DSLR cameras, the 5D Mark III includes the ability to record video continuously up to 29 minutes and 59 seconds across multiple 4GB files. Long-form filmmakers will enjoy the camera's automatic file splitting in combination with the extended memory capacity offered by dual card slots. 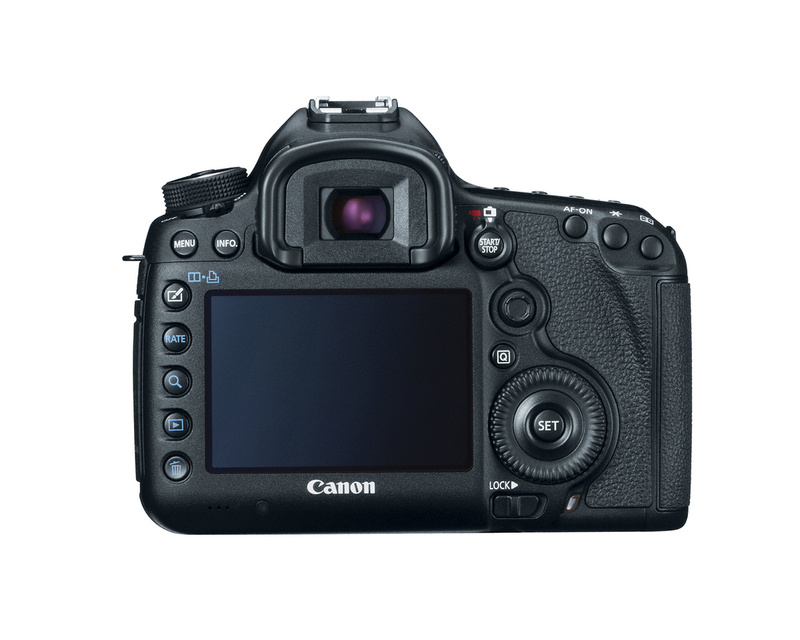 The new 5D Mark III is also equipped with Canon's EOS Integrated Cleaning System, featuring a Self Cleaning Sensor Unit with a fluorine coating that repels dust and dirt particles. The EOS 5D Mark III's new DIGIC 5+ Imaging Processor is 17 times faster than the DIGIC 4.The EOS 5D Mark III uses that extra speed not only for improved image quality, but also to add no less than nine new features that do not exist on the 5D Mark II. 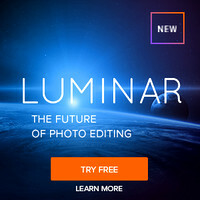 These new features include six fps continuous shooting, HDR and Multiple Exposure modes, in-camera RAW processing, a comparative playback function, Scene Intelligent Auto mode, two forms of movie compression, and support for high-speed UDMA 7 Compact Flash memory cards. Another extremely valuable feature enhanced by the DIGIC 5+ Imaging Processor is the EOS 5D Mark III's choice of reduced resolution M-RAW (10.5 megapixel) and S-RAW (5.5 megapixel) recording modes. These settings are particularly useful to wedding photographers for candid photos that do not require the EOS 5D Mark III's 22 megapixel full resolution, because they take up less space on the memory cards and speed up post-processing without losing the critical benefits of RAW image data, such as highlight and shadow control as well as white balance adjustment. M-RAW and S-RAW also preserve the full field of view rather than cropping the image or resorting to JPEG mode to reduce resolution. The EOS 5D Mark III uses the same high-performance AI Servo III AF tracking algorithm as the flagship EOS-1D X professional DSLR. This new feature works together with the 61-point High Density Reticular AF system to provide superb tracking performance that blends very well with the new camera's 6 frames-per-second high-speed continuous shooting capabilities. Complementing the EOS 5D Mark III camera's 61-point AF system is Canon's 63-zone iFCL dual layer metering system. The 'FCL' stands for 'Focus, Color and Luminance,' and references the fact that the metering system not only measures color and luminance data, but also analyzes the data provided by each point of the AF system. Canon's iFCL metering keeps exposure levels stable from shot to shot, even as the light source changes. The camera's autofocus information is also used to help determine which area of the scene is of greatest importance in determining exposure. The EOS 5D Mark III camera features a built-in HDR mode, merging three images at various exposure levels into a single image, in-camera, for stunning photographs of landscapes and architecture with enhanced tonal gradation beyond the range of the naked eye. The exposure levels in the camera's HDR mode can be set to cover a range of up to ñ3 stops, in a choice of five settings: Natural, Art Standard, Art Vivid, Art Bold and Art Embossed providing unique visual effects. 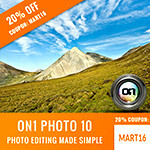 Individual source images can be saved as separate files, and the HDR mode has an optional automatic alignment function that can be useful for hand-held shooting. The EOS 5D Mark III's standard Auto Exposure Bracketing function has been upgraded to allow for up to seven exposures per sequence, and exposure compensation can now be set for up to +/- 5EV. The EOS 5D Mark III is the second EOS Digital SLR after the EOS-1D X to feature Multiple Exposure capabilities with the ability to combine up to nine individual images into a single composite image, with no need for post-processing in a computer. Four different compositing methods are provided for maximum creative control, including Additive, Average, Bright and Dark. Compositing results can be viewed in real time on the camera's LCD monitor, and there is a one-step Undo command that allows photographers to delete an image and try again if desired. The EOS 5D Mark III camera's Multiple Exposure mode even allows photographers to specify a previously captured RAW image as the starting point for a new Multiple Exposure composite image, or shoot continuously when photographing moving subjects. A new feature seen for the first time in the EOS System on the 5D Mark III is Comparative Playback allowing photographers to display two images side by side on the camera's 3.2-inch LCD screen. The images can be displayed with a histogram to check exposure levels, or magnified to check for focus or facial expressions. 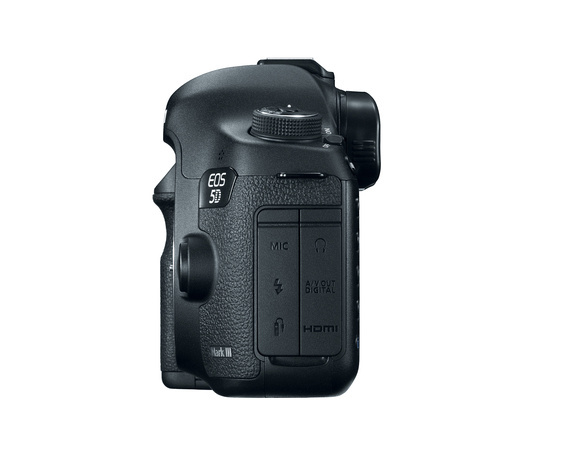 The EOS 5D Mark III features a rugged camera body with magnesium alloy body covers and a stainless steel lens mount. The new camera also has dust- and moisture-resistant design with improved gaskets and seals. Although not quite as weatherproof as an EOS-1D-series camera, the EOS 5D Mark III does feature improved weather resistance over the EOS 5D Mark II model. The EOS 5D Mark III's newly developed shutter unit has a durability rating of 150,000 exposures, and shutter release lag time has been reduced to 59 milliseconds, making the shutter button very responsive. Canon's locking mode dial is standard on the new model and a new custom function allows photographers to shut off other dials to prevent inadvertent operation. 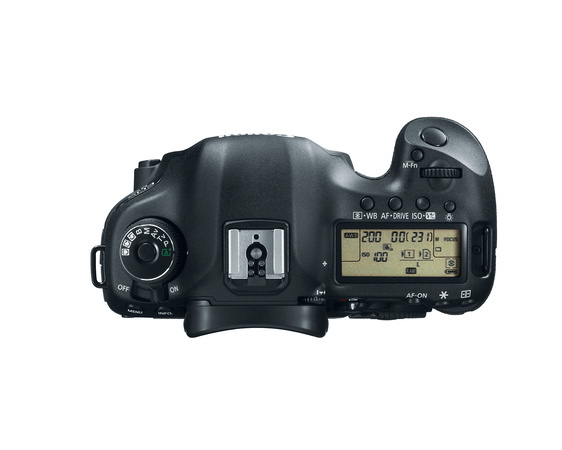 The EOS 5D Mark III features a 3.2-inch Clear View II LCD screen with 1,040,000 dot resolution. 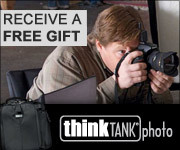 This is the same screen that's used in the top-of-the-line EOS-1D X. The camera's optical viewfinder has been upgraded to approximately 100 percent coverage, and it features an Intelligent Viewfinder display with an optional grid on demand. The EOS 5D Mark III also has a built-in Dual Axis Electronic Level that can be displayed on both the LCD screen and the optical viewfinder. 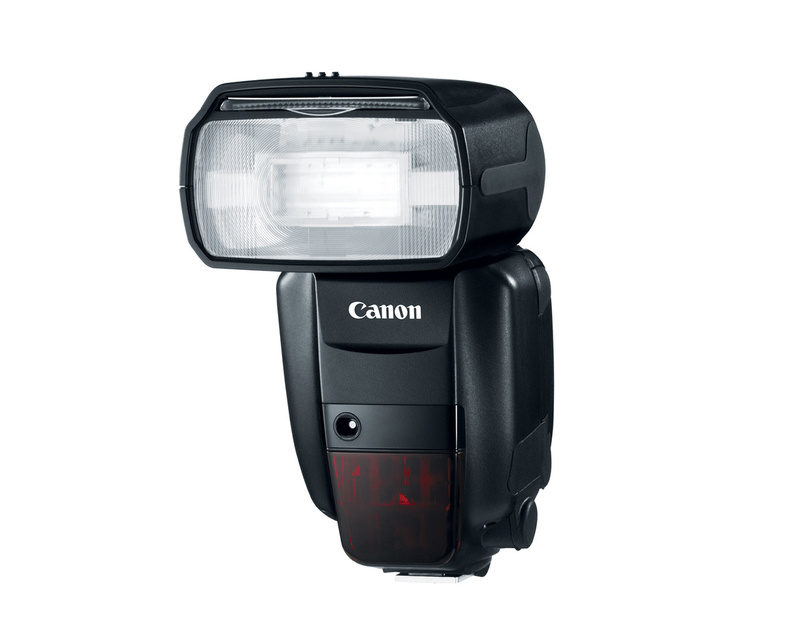 In addition to the EOS 5D Mark III, Canon is also announcing the first professional Speedlite on the market with a built-in wireless radio transmitter, the new Speedlite 600EX-RT. The new Canon Speedlite 600EX-RT is the flagship model in the Speedlite line, ideal for wedding portrait and photojournalism. Compatible with all EOS Digital SLRs, this new model eliminates the need for accessory radio slave units and their inherent limitations. Speedlite 600EX-RT features Master-Slave two-way transmission, letting the photographer control the Speedlite settings directly from the "Master" camera. 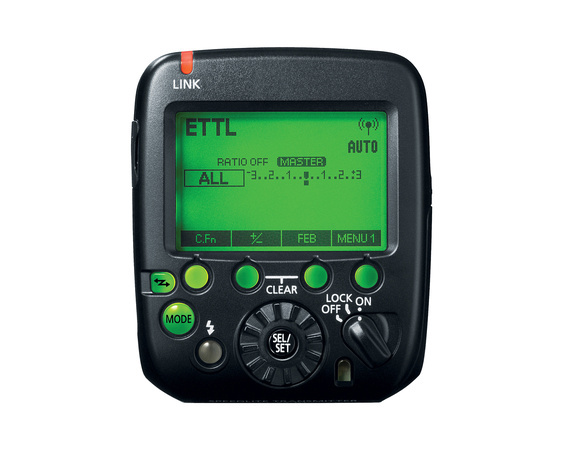 Radio-based Wireless E-TTL can be performed with up to 15 Speedlite 600EX-RT "slave units", used off-camera up to 98.4 feet (30m) away, and triggered by either a "Master" 600EX-RT on-camera, or the optional new Speedlite Transmitter ST-E3-RT. Used with the EOS 5D Mark III or EOS-1D X, up to five groups of flashes can be completely controlled, independently, off-camera. And, it remains fully compatible with Canon's legacy optical-based Wireless E-TTL technology, for users already committed to existing EOS Speedlites. The Speedlite features enhanced weather-resistant construction - matching that of the EOS-1D X camera body - and a more reliable electrical contact. The flash head zoom range now reaches from 20mm to 200mm.The Speedlite also allows remote shutter release of a single EOS camera, or Linked Shooting (simultaneous firing of up to 15 cameras, when one "Master" camera is fired), and includes gelatin filters and a dedicated filter holder to help photographers match ambient light. 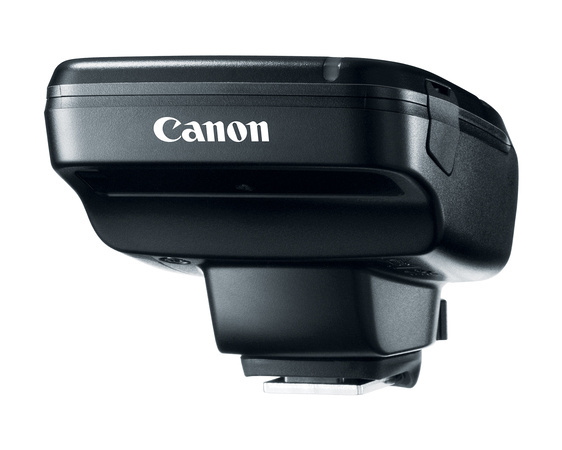 Canon is also introducing the new Speedlite Transmitter ST-E3-RT. Providing full support of Canon's new radio-based wireless flash technology, the new ST-E3-RT can control up to five groups of flashes, up to 98.4 feet (30m) from the camera. The remote shutter release capability enables photographers to either fire a single camera remotely (by pressing a button on the ST-E3-RT), or to fire up to 15 EOS cameras with Canon's Linked Shooting feature. 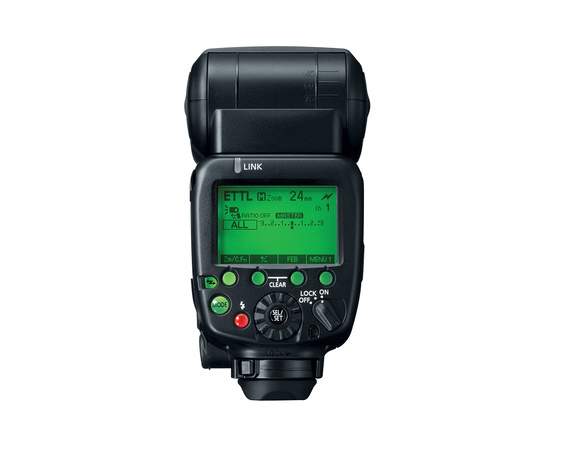 Making it easy to control and adjust, all of the Speedlite Transmitter features are accessible through the Flash control menu of the EOS-1D X and EOS 5D Mark III cameras. I may make a commission if you make purchases using links in this article. Do you know if the Mark III will work with the pocket wizard mini TT1 and Flex TT5? No, pocket wizards use a different frequency.